Author(s): Mustafa Sinan Kaynak, Mustafa Celebier, Emrah Akgeyik, Selma Sahin, Department of Pharmaceutical Technology, Faculty of Pharmacy, Hacettepe University, Ankara, Turkey. Sacide Altınoz. Introduction: The main objective of this study was to investigate the effect of pH on the solubility and intestinal permeability of ketoprofen by using HPLC. Ketoprofen is a slightly soluble acidic drug, and its solubility in aqueous phase is affected by pH changes dramatically. However, there is no data in the literature to support whether this pH dependent water solubility of ketoprofen will influence its absorption/bioavailability. 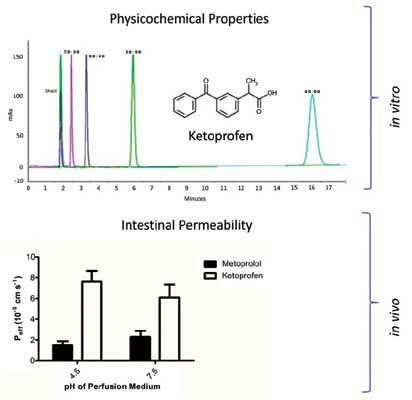 Method: In this study, the distribution-coefficient (log D) of ketoprofen at various pH values between 4.5 and 7.5 were investigated using HPLC, and then it was made an attempt to correlate the log D values with the intestinal permeability values. For this reason, in vivo intestinal permeability studies were performed at pH 4.5 and pH 7.5. The concentrations of model and reference compounds and also the blank buffers passed though the rat intestine were analyzed by means of a validated HPLC method. Result: A nonlinear relationship was found between the results of in vitro and in vivo studies indicating that the diffusion of ketoprofen was not only related with passive diffusion, but also could be related with active transport. Affiliation:Department of Pharmaceutical Technology, Faculty of Pharmacy, Hacettepe University, Ankara, Turkey.